And it stoned me to my soul. I’d say this tune is a guilty pleasure but I don’t feel guilty at all. This has riffs big enough to slay an orc and it’s got a good beat and I can dance to it. OK OK so we all know the Bjork record got leaked a week ago. I picked up my copy like a good music geek that I am. From the opening strings of Stonemilker to the all too quick end of Quicksand I was smitten. Taken away to a world where heartache was real but yet otherworldly and strange. When I first heard it i was in the middle of reading Norwegian Wood, Murakami’s early novel of youthful romantic angst. Now in a way nothing could be more different. The Bjork record is, despite it’s otherworldliness, steeped in the painfully real- how a break up affects your family and child’s world. Norwegian Wood is all marinated in youth and first loves and the kind of sweet heartache you only really feel when you’re in your late teens and early 20’s. “I am fine tuning my soul to the universal wavelength/No one is a lover alone […] let this ugly wound breathe”. That’s Bjork being, well, Bjork. And that’s Murakami being super romantic and fatalistic. Bjork is more real and honest about the devastation of a breakup later in life. Murakami gives you the “world is going to end” feeling you get when you breakup with your first love. Both are devastating but of course Bjork’s is more so. “If she sinks/I’m going down with her … When we’re broken we are whole/And when we’re whole we’re broken… every time you give up, you take away our future/And my continuity and my daughter’s”. Come on already!! You’re dead, right? How much you want to suffer I leave up to the reader. The record is great. A 21st century upgrade to Blood on the Tracks but with more at stake. 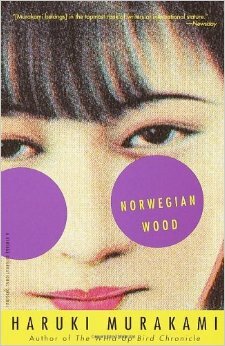 Norwegian Wood is pretty good too. If I read it at 18 it would’ve have been one of those books like Catcher in the Rye or Tropic of Cancer that just stayed with you forever and made a huge impression. But I’m 45 so Bjork kills it (and me).